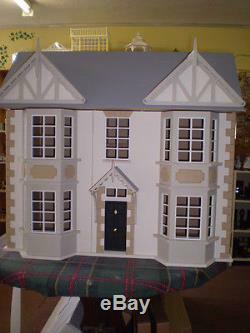 1/12th scale Grand Victorian House with attractive Bay Windows. Overall size (W x H x D) 775 x 700 x 360 mm. (30.5 x 27.5 x 14.25). The ground and 1st floor rooms are identical being. Attic is 285 x 320 x 200mm (11.5 x 12.5 x 7.75). The picture shows the House on its Basement which is available at extra charge. The kit comes in plain MDF i. Other locations available on request. The item "1/12th scale Victorian Dolls House-The Cedars" is in sale since Wednesday, November 16, 2011. This item is in the category "Dolls & Bears\Dolls' Miniatures & Houses\Dolls' Houses". The seller is "redmillski" and is located in Bristol, Avon. This item can be shipped to United Kingdom, Austria, Belgium, Bulgaria, Croatia, Cyprus, Czech republic, Denmark, Estonia, Finland, Germany, Greece, Hungary, Ireland, Italy, Latvia, Lithuania, Luxembourg, Malta, Netherlands, Poland, Portugal, Romania, Slovakia, Slovenia, Spain, Sweden, Australia, United States, Russian federation, Canada, New Zealand, Norway, Switzerland.